What up pie fans!? It’s me! The self anointed prince of pie, here to spread another pastry review all over the world wide web. As the idea of writing a book continues to take shape I have been looking back over some of my past pastry conquests to see how easily I can knit all these component parts together. I had already known that the reviews from this sites infant days were far less detailed than those I find myself scribing now but what I hadn’t considered was how the style of my writing has evolved, how the content has varied, and how Meat Filled Pastries has become more than just an ode to pies but a project that has taken me to places that a much younger me would be a little bit envious of. I mean, it’s not commentating on a Scottish victory in the World Cup Final but its a start and as life continues to show me you’ve got to take what you can get and run with it and as long as people want it I’ll continue to find new ways to spread the word of pie whilst being a champion for football’s little guys. You never know maybe one day that World Cup Final dream could become a reality. So with that in mind, and without much further ado, let’s rate some pie! It’s a Tommy The Tank! Price: £1.20. The same price as the last offering from Cumbernauld United and about par for the course when it comes to junior pies as the end of the season draws near. Presentation: Presented simply on a medium-sized white napkin, although two may have been more appropriate (more on that later). Take Two Pies. Eat One. Then Take a Picture of the Other. Meatiness: This was a well seasoned pie although somewhat missing a peppery kick with the butcher (or baker) focusing more on bringing the most possible flavour out of the mutton within. I mentioned a few moments ago that this pie would have benefited from a second layer of napkining and this was in part due to it being quite greasy, not greasy enough to compare it to the waterfall that cascades from the Beith Pie, but enough for a drop or two to hit the floor below. It also seeped onto the napkin meaning that to wipe your face you had to use a napkin that was already rather greasy, thus replacing the grease that you had just removed from your face. It was a vicious cycle but one I persevered because ultimately it was a tasty pie, I think. Pastry: The pastry was soft, which can be attributed to the grease around the sides but was rather well fired underneath. This in the end helped consumption as you could tip the pie away from you as the grease looked as it was destined to end up all over the place. Practically it helped but if Paul and Mary were to be presented with it you just know there would be a sigh or two. I don’t really get the need for them all but it was impressive nonetheless. Overall: As I spoke to people about this pie it definitely split the crowd. The fact it was quite greasy counted against it while the fact it was actually pretty tasty worked in its favour. I found myself somewhere in the middle. Gravy Factor: Aaaah I’m so confused by this pie, in some ways great in others not quite right. It’s definitely gravy, but of what variety? I think on this occasion I’ll leave that totally up to you. I’ve got a plan for pie 99 but as yet no destination for it. So until next time go forth and eat pie! This entry was posted in Football Pies, Junior Pies, Sporting Pies, The Life of Pie and tagged brown sauce, fitbaw, Football, Gravy, grease, irvine victoria, Juniors, Meat, meat filled pastries, pastry, pollok, reggae reggae, scottish football. Hello and welcome back to Meat Filled Pastries. Home of the greatest sporting snacks that Mother Earth has so generously bestowed upon us. This pie review is written with more than a splodge of sadness, not for the ketchup blob you see before you, but because this pie symbolised the end of my 28 year run as a football fan without suffering the heartache of relegation. I’ve put a positive spin on it in my latest non-pie piece for Meat Filled Pastries, ‘Relegation: It’s Not All Bad, Is It?’ (http://wp.me/p3Q7wL-34), and the fact a whole new world of pie has been opened up to me is one of the few shining lights at the end of a pretty terrible season. However let us not dwell on such matters, I am a pie professional and as such I will give a fair and honest assessment of this Monday evening offering from the world of Scottish football. Price: You know what, I’m not even writing it. 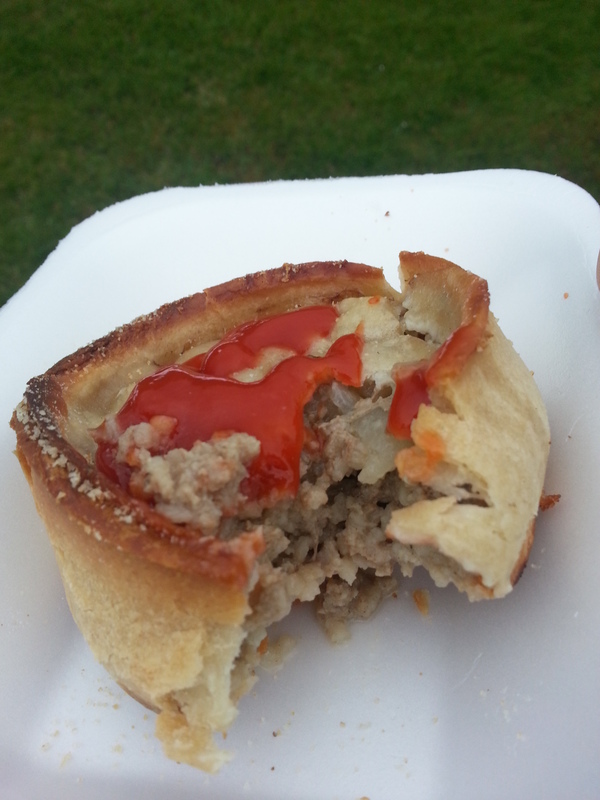 If you keep up to date with Meat Filled Pastries you know how much a junior football pie is…………. ………OK, OK, it was £1.20 but the only reason I tell you know is because I realised half way through that previous sentence that some of you may not keep up to date with my stories of pie, and whilst I chastise you for doing so, I am nothing but a benevolent host. Presentation: This was presented in a polystyrene try which when looking around also doubled as a chip holder. It meant that the pie’s heat was kept safe froom my palm although it also led to it not being held as securely as it would have been snugly fitted into my hand whilst wrapped in a napkin. Which brings me to the other point about the presentation, there was no napkin, meaning that I had to resort to the ‘rubbing-your-hands-together-really-fast-so-that-all-the-spillages-either-absorb-into-your-skin-or-drop-off-altogether-technique’. A slight distraction from the game going on around me. As I surveyed the pie before me I did find myself wondering that if this was a Saturday afternoon and not a Monday night things, in the presentation stakes at least, may have been very different. 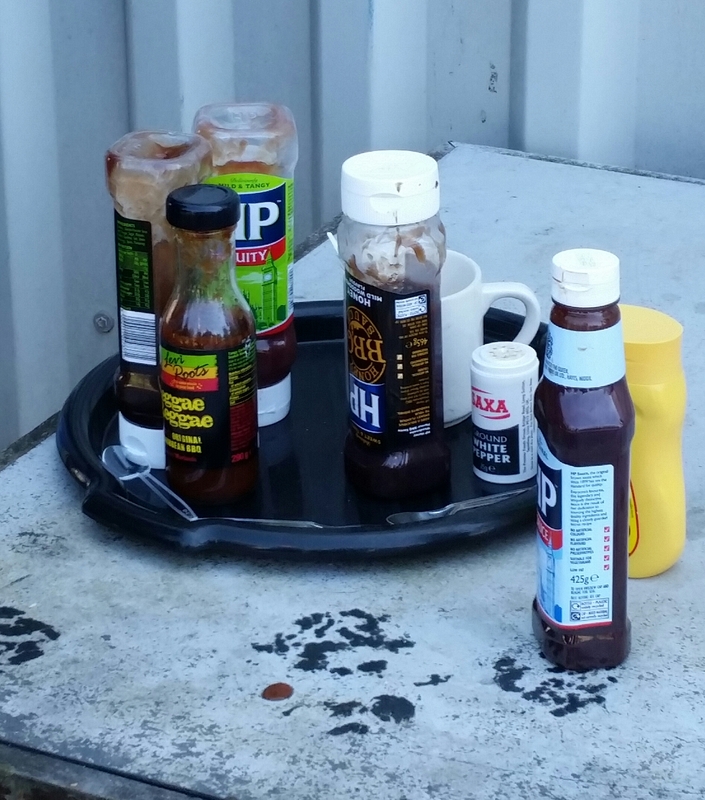 Meatiness: Speaking of things that were different there was no brown sauce! No golden brown tang to smatter on my pie! Once again I put this down to it being a Monday night but it didn’t make it any less distressing. Saucing issues aside this was a tasty, well seasoned if somewhat wet pie. I say wet as opposed to greasy because although there was plenty of moisture within the pie at no point did I feel a tidal wave of grease flowing down my gullet although I did feel it crumble a little with every bite I took. As a result of this it was really messy to eat but I was enjoying it. The other thing that struck me was that despite no indication as to this being anything other than a standard scotch pie it was clearly of the oniony persuasion. It was laden with large pieces of translucent onion adding a note of sweetness I have came to expect from an onion pie. I kid myself that an onion pie counts as 1 of my five-a-day but I feel confident in saying this offering is the closest I have came to eating a vegetable on this journey. I just wish there was some brown sauce. Pastry: As I said the pie filling itself was quite wet and as I hope you can see from the one bite expose above this caused the pie to fall apart somewhat as I ate. First the pastry walls, although crisp at the top, started to cave and then the base slowly fell apart in my hand. In the end I was actually quite thankful for the polystyrene tray as it provided a perfect boat shaped receptacle for this pastries meaty cargo. Overall: As onion pies go this was pretty good it was incredibly moist without the flavour being washed away however I cannot condone the lack of napkins and brown sauce. A taste sensation in the mouth but more than a handful when it came to its consumption. Gravy Factor: Can you get anything moister than gravy? If so this is it. Moist Gravy. The next review from Meat Filled Pastries will be from New Douglas Park home of Hamilton Academicals where I had the pleasure of watching THAT game. This entry was posted in Football Pies, Junior Pies, Luxury Pies, Sporting Pies and tagged accies, brown sauce, fitbaw, Football, glenafton, Gravy, grease, hamilton, junior football, ketchup, loch park, Meat, meatfilledpastries, mince, morton, new douglas park, pastry, Pie, pollok, relegation. A pie for every minute in an hour, that’s the stage we’ve got to as the season enters its final throngs and a pie on a warm sunny day becomes anever increasing possibility. If you weren’t aware of it already this is Meat Filled Pastries, one man’s mission to keep pies at the forefront of footballsnackage on the terraces up and down this wonderful land of ours. I write this as I sit and watch Barcelona vAthletico Madrid in the Champions League and I wonder what the pies are like at the Nou Camp? I assume the answer is non-existent; my only experience of Spanish football to date coming at Tenerife v Barcelona B where the snack of choice was sunflower seeds, husked at the teeth and available in a variety of flavours. A surprisingly tasty but very messy and distracting footballing snack. But what about snacks across the rest of the world, what do they eat there? What do they do when they need something to get them through to dinner time? The Germans are known for beer and sausage but outside of this is their any country in the world where a food stuff can be so intrinsically linked to football as the humble pie is in bonnie Scotland. With a World Cup on the horizon and the barren pie weeks of the summer to contend with, perhaps we will look to find out more in the future, but for now, and without much further ado, let’s rate some pie. Price: Priced at £1.20, yeah £1.20 your average junior pie price. Let’s just move on. Presentation: This pie was presented in the standard medium-sized white napkin that we have all come to know and love however the real stand out memory from this visit was the fierceness of the lassie behind the counter. Almost demanding the queue of men awaiting their post pint snack to announce themselves as the ‘First One’s There!’, if they dared to admit it. I would hate to think what kind of moist panted panic would have ran down the legs od the few that had got to the window and not known what they wanted. OK, I may be exaggerating a bit but for some I would imagine it could genuinely be a little bit frightening. 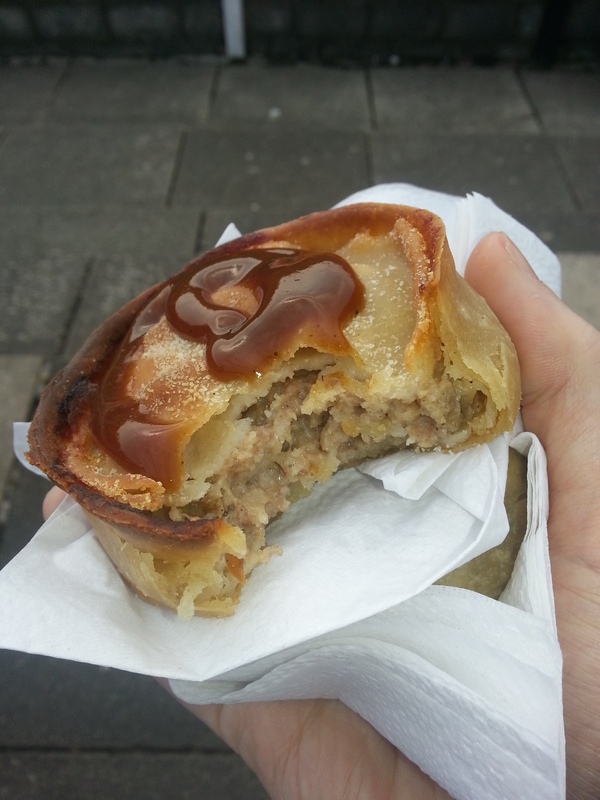 Meatiness: This was a proper scotch pie with a fairly solid meaty block held within the pastry. It was well textured and a had the peppery kick that I have oh so been missing in my recent pie based exploits. The meat was moist although for my taste perhaps just a little greasy as could be seen by the light pie stain on my napkin after completing consumption. Ignoring that though the meat was well seasoned and the brown sauce dollop that has caused me a few issues in recent weeks returned to its rightful place atop a scotch pie, adding another layer of flavour to the meat inside. Taking all these points into consideration this was a solid filling to a scotch mince pie. Pastry: The pastry was more of receptacle to the pie as opposed to adding any great waves of flavour. As can be seen from the one bite expose it was a little well fired in places which for me is fine but for some others that may be disappointing. This meant that the pastry was incredibly crisp and on occasion broke off into small shards. No real inconvenience as sometimes I like to do dip the outer edge of the crusts into the puddle of brown sauce above, you know just to mix up the pie eating experience a bit. This pastry did the job it was intended for. Overall: As previously stated it had been a while since I have had a scotch pie, in its truest form, in my hand. It had a nice pepper kick and lovely crispy pastry. It was a little bit greasy and if I’m being honest it won’t live long in the memory but it was a tasty version of a scotch pie and one that I wouldn’t be disappointed to have pass by my lips again. 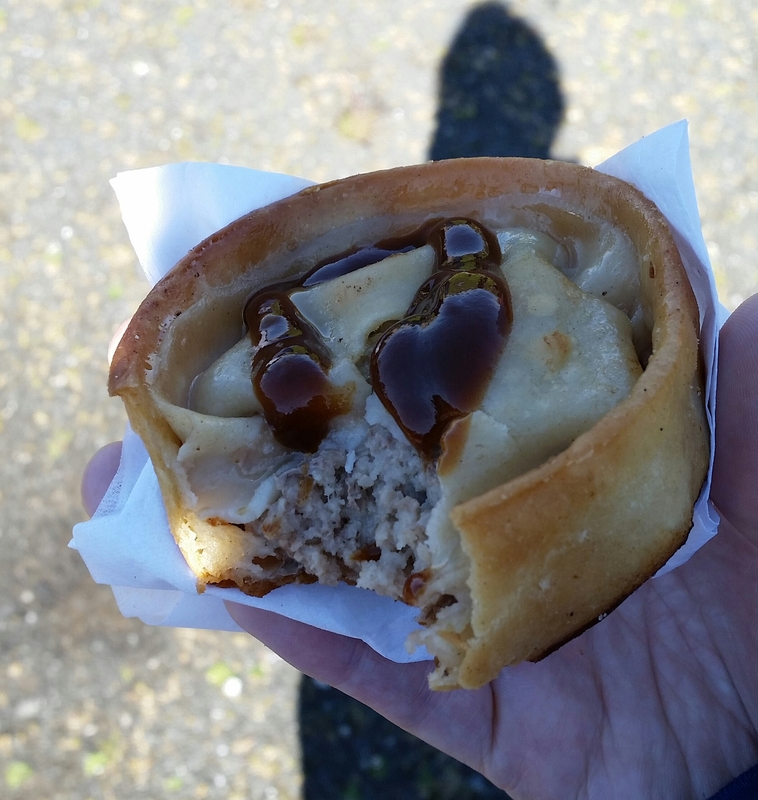 Gravy Factor: The Return of the Snack, the scotch pie snack that is. Another meat filled marvel down, and still so many more to go. The next one will be The Onion Pie offering from Cumnock. How will it stack up against the previously reviewed Onion Pie offering from near rivals Auchinleck Talbot, although I can assure you even I’m not brave enough to tell you which one I think is better. They are all pie and as such are welcomed gleefully into my belly. My latest non pie piece ’Pretty in Pink’ is found not only on Leading The Line but also at www.footballbloggingawards.co.uk looking at some of the pinkest kits you’re eyes ever did see and the stories behind them. I also encourage you to look out for my piece ‘Defining World Class’ on the same site, you’ll have to scroll down a bit but it’s definitely worth a read. Something new will be coming soon. Did you know you can Subscribe to Pie? Simply go to www.meatfilledpastries.com and hit the ‘Follow’ link on the right and you will get an email advising of the glorious news that a new pie blog is ready for your consumption and while you are at it why not have a look at ‘Leading The Line’ a blog not based solely on Pies, crazy I know! The link is on the left hand side, and remember to visit ‘MeatFilledMerch’ for all your pie fashion needs where any personal profit made will go to The Grambler: Kick Cancer’s Backside Fund’ a truly worthwhile cause. This entry was posted in Football Pies, Junior Pies, Sporting Pies, The Life of Pie and tagged auchinleck talbot, brown sauce, cumnock, Football, football blogging awards, Gravy, grease, junior football, lassies, leading the line, Meat, meat filled merch, meat filled pastries, mince, pastry, Pie, pollok. Word up pie fans! Straight from the meat filled ghetto I am happy to present to you Pie 30 of Meat Filled Pastries: Tour of Pies ‘The Beith Pie’. As promised in my last review I have a couple of announces to make. I have been doing Meat Filled Pastries for 3 months now and I am delighted that people seem to like this little project. To be fair if people didn’t like I’d probably still be here wittering on about pies but I would just like to take the opportunity to say thank you to everyone who has read, liked, tweeted, commented and shared with their friends in what ever way you have. I hope this is the start of something that I will keep going for many a pie to come. On the back of all your support I am delighted to announce that Meat Filled Pastries will be live on air between 8-9pm on Thursday October 31st on Pulse 98.4FM, available on your radio’s in the South of Glasgow and East Renfrewshire area or by the ‘Listen Live’ function on the station website http://www.pulseonair.co.uk/. I will be a guest on ‘Nugent4Nil’ a programme focused on Scottish junior football (on Thursday night) the pies provided by these teams. It will be my first appearance on the radio for over 4 years and it’s safe to say I’m looking forward to it. If you have a bit of free time give it a listen. Secondly I am proud to announce that Meat Filled Pastries now has on offer MeatFilledMerch. Dedicated to all your pie based fashion needs, whatever they may be. You can find the store at http://meatfilledmerch.spreadshirt.co.uk/ and the link is on the right hand side of the site. This is very much in it’s infancy but I hope over the coming weeks I’ll items you may actually want to wear and buy! I would also like to make you aware that any personal profit made on anything bought from ‘MeatFilledMerch‘ will go straight to ‘The Grambler’s Kick Arse Fund’, the full story of which can be found at the following link, http://www.justgiving.com/Geraldine-Smith3, if you could take a look it would mean a lot. So yeah, busy times at MFP HQ, but now back to the main business of the day, let’s rate some pie! 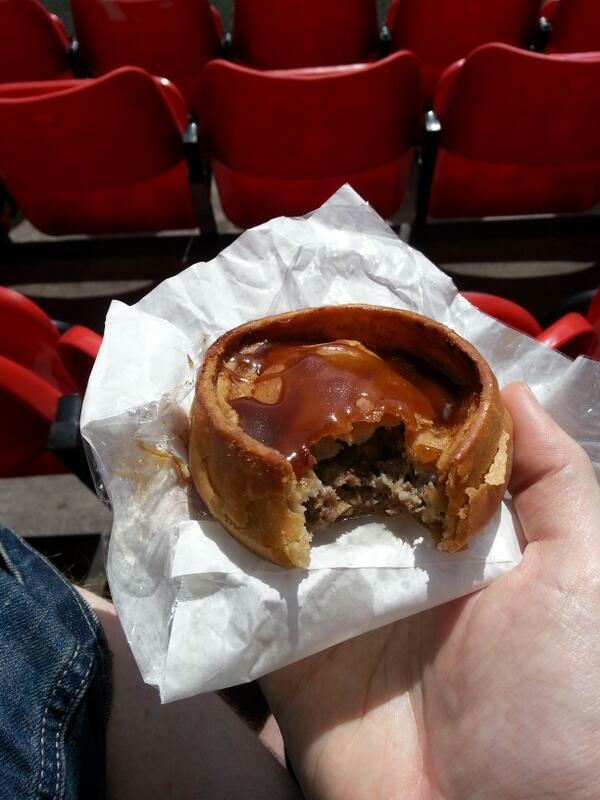 Price: At £1.10 about par for a junior football scotch pie. Presentation: As previously mentioned in ‘Pie 29: The Beith ‘Chicken & Haggis’ Pie’ this came wrapped in a local bakery branded large napkin by the name of Irvine’s. There was however no tinfoil case, of which I approve, as a good scotch pie should be able to hold itself up securely in the safety of a suitably sized napkin. Meatiness: The meat was moist and quite flavourful, not particularly peppery but pleasant enough. Unfortunately though this is where the good times end as once the first bite is taken your mouth is subject to a tidal wave of hot grease. A tidal wave !?!? An exaggeration too far you say. Well I counter your act of flippancy at my suggestion by confirming that on tipping the pie to a 90 degree angle a continuous stream of grease came dripping out for just over 19 seconds before subsiding. That’s right, it was that greasy that I thought it worthy enough to get a timer out. Now I should say if you love a greasy pie, then you will love this one but for me every bite left a greasy film that covered every corner of the inside of my mouth. It washed away any of the meaty goodness inside and left my arteries feeling more clogged up than a San Marino’s defence whilst 1-0 up against Scotland with 5 minutes to go. It was such a shame after the highs of the previous Beith based pie. Pastry: The pastry for what it’s worth was good, although as can be seen from above came with a glistening puddle of fat atop of it meaning that it got soft very quickly, it held well when a bite was taken but was victim to the same gush of grease that put paid to the taste of the meaty filling. Overall: Part of the tag line of this site is ‘Let the grease hit my elbows’, the grease within this pie though not only would have hit my elbows but made it down to my knees and into my toes. I’m just here to give one man’s honest opinion on pie and If you like your pies greasy then this will be right up your street but for me unfortunately it fell short of the mark. The short taste of meat I managed to get suggested there is a good pie waiting to get out but until the grease is reduced considerably I’ll continue to wish for another one of those beautiful ‘Chicken & Haggis’ offerings. Gravy Factor: The kind of gravy that started off using bones and scraps for a flavoursome stock but then forgets to skim the fat off the top before leaving it to sit out for a few days. Greasy Gravy. So another pie review done, and a decidedly mixed bag from Beith. 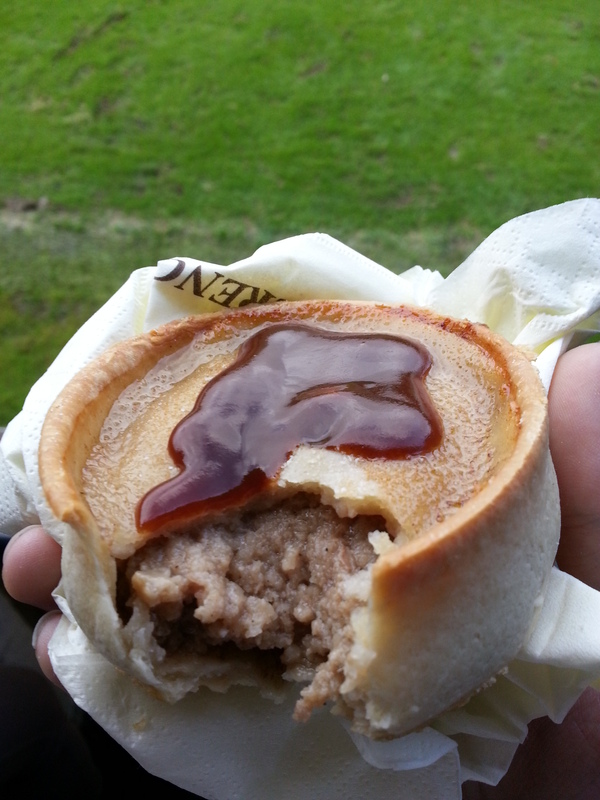 All going well next week’s review will be fresh from the ovens of Moray as Meat Filled Pastries hit’s the Scottish Junior Cup trail to Dufftown but until then go forth and eat pie. Did you know you can Subscribe to Pie? Simply click on the ‘Follow’ link on the right and you will get an email advising of the glorious news that a new pie blog is ready for your consumption and while your at it why not have a look at ‘Leading The Line’ a blog not based solely on Pies, crazy I know! The link is on the left hand side, and remember to tune in to Pulse 98.4 on Thursday 31st October for some live pie and visit ‘MeatFilledMerch’ for all your pie fashion needs. This entry was posted in Football Pies, Junior Pies, Sporting Pies, The Life of Pie and tagged beith, brown sauce, charity, dufftown, Football, grambler, grease, junior football, Meat, meatfilledmerch, mince, nugent4nil, pastry, Pie, pollok, pulse 98.4, radio, scotland, scottish junior cup, west of scotland. Controversy, at Meat Filled Pastries HQ? I had drank a LOT of Tequila the previous evening. Tequila is generally NOT conducive to wanting to feast on Meat Filled Pastries, however with that being said after a can of that well known Scottish elixir of life Irn Bru, I gathered myself and tucked right in. So without further ado, lets Rate Some Pie! Presentation: The pie was presented in a half paper, half plastic bag, an unusual presentation technique for a pie and one that was not a success in this instance. For a start the paper was not enough to contain the pie’s heat, providing insufficient protection from the warmth that a napkin would, luckily they were on hand although were rather on the small side. Then we have the plastic, oh deary, deary me, the plastic. Helping to create what can only be described as a ‘sweaty’ pie, with a thin layer of grease wrapped all the way around the outside making the need for a napkin of greater substance even more paramount. Meatiness: A Scotch Pie things were disappointing here as well. Somewhere there is a pie maker, in his hairnet and white coat, furiously grinding salt and pepper into an empty pie case because mine certainly was lacking the seasoning a good pie requires. Not even the saviour of many a poor pastry, Brown Sauce, could provide the flavour kick my heart desired. Pastry: The pastry was ample, too ample for the meat that was provided. It was well browned but due to the way the pie was kept warm in the plastic and paper it took on the taste and crunch of something deep fried as opposed to lovingly baked in the oven. It like most of the rest of the pie left an unsatisfying layer of grease on your lips after every bite. Overall: Look I want all pie’s to be meat filled delights, but I have to be honest and this is the first pie on my journey that didn’t hit the mark. It was never given a chance the moment it was left to steep under a heating lamp wrapped in plastic, whilst the filling was lacking in that meaty punch in the chops that every football fan is looking for. Gravy Factor: Anaemic gravy, somebody used one scoop of the best Bisto they could get their hands on when 3 or 4 were required. Did you know you can Subscribe to Pie? Simply click on the ‘Follow’ link on the right and you will get an email advising of the glorious news that a new pie blog is ready for your consumption and while your at why not have a look at ‘Leading The Line’ a blog not based solely on Pies, crazy I know! The link is on the left hand side. 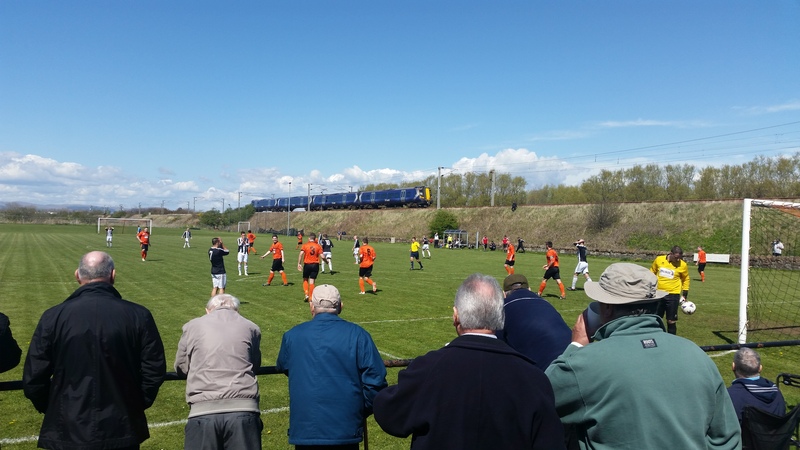 This entry was posted in Football Pies, Junior Pies, Sporting Pies, The Life of Pie and tagged bisto, brown sauce, Football, Gravy, grease, junior football, Meat, petershill, Pie, pollok, scotland, SuperLeague.